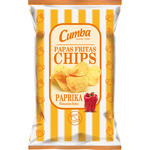 The origins of Cumba back to 1980 where he began his activity at an early stage as a distributor of consumer products on impulse, especially snacks, under the direction of Gonzalo Medina Ramos. 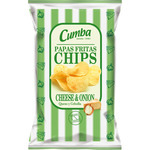 In 1995 they sought an alternative to the brand of crisps and snacks distributing, which was CRECS , and decided to take the "adventure" of creating its own factory. 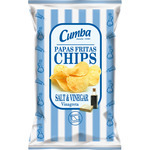 Since 2008, he is the only manufacturer to fry "chips" in its own product Canary Island, from May to September, and the rest of the year in England product. In the packaging it differs well when potatoes are authentic island when they are not. 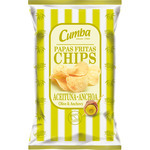 Currently he ranked second in the ranking of consumption of chips in Gran Canaria after Matutano. Besides making their appetizers, continues to activity of marketing products with exclusive brands as Mondelez ,Damel Products and Haribo . The year 2000 marked a major turning point has shown much growth in the post, with the move to the new factory in the industrial estate the Goro. 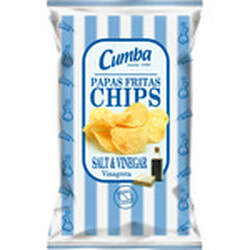 In 2005, the manufacture of chips and snacks, added the toasted nuts. In 2009, it absorbed its subsidiary Insular Appetizers, whose production of snacks, chips and nuts and marketed, entering the Insular team. They are currently undertaking a major redesign and corporate rethinking. "Especially the range of potatoes, in addition to the new logo, new flavors and overall reformulation". They have facilities covering an area of over 6,200 square meters in which has two lines for the manufacture of fried pellets, extruded a line to another line for potatoes, a line of fried nuts and other fruits toasted line dry. Its production capacity is 4,000 tons of product, with a turnover of 10 million euros. It employs 50 people. 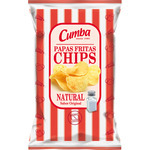 ​Francisco Lopez, CEO of Cumba: "We are the second brand of chips in Canarias"
To Cumba 2013, a year that has not been large investments, but to optimize facilities- "ended with sales support, noticing yet cooling of domestic consumption. " Therefore, they have modernized "the packagingand made a reformulation of products as well as launches of new lines ", a process that will continue for 2014. In this year," we aim to double-digit growth, ambitious, but we are convinced it will be possible, "said Francisco Lopez Sweet news ... and more , convinced that "consumption begins to increase." They are also enhancing the sales network, "increasing the number of routes, so that no corner of our natural market, the Canary Islands, left without the presence of our products." "Finally, we believe it is time to ask our openness to other (African and mainland) markets where we believe we have the capacity and quality to penetrate them," says the CEO.